Well, we took it on the chin today. Over the past 10 days I’d corresponded with Tom S. of Michigan who was due into Georgetown on a business trip. I’d let him know the fishing had been tough, but was picking up and would be weather dependent. Within 10 hours prior to our launch time Wunderground.com (a typically very reliable weather source) predicted light SW winds at 4mph around sunrise with 100% cloudy skies, and with winds coming through the west, then turning NW by early afternoon. I was really enthused by that forecast, as SW to W winds and cloud cover are a great combination. Then it happened … not 20 minutes after we launched, as we were still searching with sonar over the first area we were going to fish, the NW wind cranked up to 15, then 20, then gusted higher, and the skies immediately cleared. I got that sinking feeling that some of you will identify with. BEING THE SWELL GUY HE IS, UPON RETURNING TO MICHIGAN, TOM RUBBED SALT IN THE WOUND BY SENDING THIS ALONG THE WEEKEND AFTER OUR TRIP!! Air Temp: 47F at trip’s start. Skies: Skies cleared with the arrival of a dry cold front beginning around 7:45am. We fished all over Stillhouse and, in 5 hours of effort, managed only 2 fish — a small crappie and a small white bass. The crappie came off of Area 140 in 26 feet on bottom, and the white bass came off of Area 116 in 14 feet on bottom. We encountered no schools, no active, bottom-oriented fish, just nothing, save a few scattered suspended fish at Area 598. Tom got one to follow his ice jig, and strike, but we missed that one. The water temperature fell during the early-week cold snap that brought 3+ inches of snow accumulation, and then bounced back to where it was, around 49 F, with 2 days of clear, calm, sunny conditions immediately afterwards. Fishing is just plain tough right now with unseasonably cold water, and nothing short of ideal weather conditions seems to perk these fish up. Today we zigged when the weather zagged and we came up short. I don’t mind fishing solo in conditions like this, but just hated that I had a client on board when things went sour. Today I welcomed repeat clients Jim and Shena S. aboard. Jim and Shena are a neat father/daughter pair that just love one another and enjoy spending time out in the Creation with one another. We got an opportunity to fish together back in the Fall, and then missed a trip in December due to illness, so, it was good to be reunited today. If I may brag a bit — I HAVE GREAT CLIENTS!! 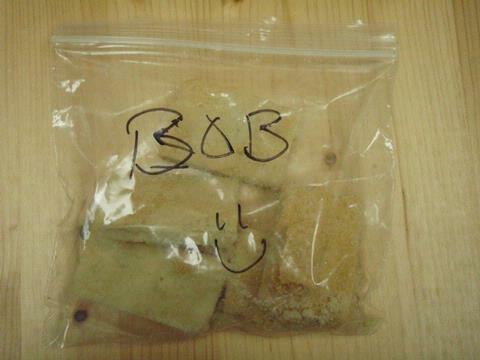 — this was a homemade batch of shortbread cookies made just for me. Thanks, Shena! Skies: Skies were leaden grey and heavy the entire trip with a cool mist falling through 11:30am. I was very optimistic as we met and launched out in the morning, as I’d just come off of an 88 fish day yesterday, and the weather forecast was calling for more of the same kind of weather we experienced then. Upon arriving in advance of the trip, however, I realized this was not to be. The wind was nearly slack before sunrise and the skies were very heavy with mist falling. Once the wind did begin to move, it just puffed lightly and with an easterly component to it. The bottom line is that we struggled all morning in shallow water and deep, in clear water and stained, uplake and downlake. By 11:20am, we’d boated only 3 fish and had missed one other (a crappie and a white bass at Area 314, and another white bass off Area 100). But, knowing that winter fishing even under good conditions, can consist of brief flurries of activity, I had asked Jim and Shena to pack a lunch so that if we didn’t do well in the morning we could press on into the afternoon. We broke for a shore lunch, and over that time, the skies brightened, the winds warmed, and the breeze got some velocity and direction to it. By 12:30 we were back out after fish with a renewed sense of optimism. I went back to basics and focused on wind impacted areas first, and, the first such area we hit literally lit up with both bait and gamefish, both suspended, over about a 32 foot bottom. These fish were holding off a breakline, so, I motored over the breakline hoping more active fish relating to bottom would be there, but, we found none. So, we returned to the suspended congregation of fish and began to work them over with a “sniping” approach. I landed one fish this way after the three of us had been refused by perhaps a dozen or more other fish previous to my hooking that one — but, the lid was cracked! We hung in this area, and, as it continued to warm and the wind continued to build, the fish slowly eased into a feed. At this area, Area 536 (BA: 3L, 3HG, 2T) we rode out the entire bell curve of the feed here from ramp up, to a brief peak, to the tailing off, and were rewarded with a total of 27 fish coming off this area in about an hour and fifteen minutes’ time. It was now mid-afternoon, we’d just seen a good bite develop and then shut down, but, I had good people on board, who were enthusiastic, friendly, and eager to learn, so, we went and checked out 3 more areas with sonar just in case that wind was stirring up other fish as it impacted bottom features. We picked up two quick fish — a white and a crappie — at Area 537, but never saw a school of fish nor bait. Finally, we revisited Area 595 (BA:3L, 2HG) and found active, albeit stubborn, fish here in 17 to 24 feet of water on top of and down the face of the breakline. I say these fish were stubborn as 1) they refused to come more than 4-6 inches off of bottom, 2) despite a great number of fish being present here, we only had 2 or 3 instances where schoolmates would chase a hooked fish for ANY distance off bottom, 3) the fish would not respond to an “easing” tactic, and 4) we often had to hold our baits still for extended periods to provoke a response. Regardless, we added 22 fish to the tally here including 2 largemouth, both caught by Jim, a drum, and 19 white bass, all of which were solid, healthy, fish right at 11.75 to 13 inches. Once this bite died, I knew we’d seen the best of it and we called it a good day by day’s end. ***For a complete listing of gear and lures used, please go to the “About” tab, and click on the “About Your Guide” page on the drop-down menu. Following this morning’s half-day uncle/nephew trip, I took a break around mid-day and then returned with the lessons of the morning learned in order to try to ferret out some more fish-holding locations for trips to come and to continue to try to “get smart” on this post-flood, cold water situation we’re faced with right now. This was the first largemouth I’ve found mixed in with white bass since before the recent flooding and drop in water temperatures. Skies: Skies were leaden grey and heavy the entire trip. With limited time available to me this afternoon, I ran a lot of sonar and only quickly fished to test areas that looked promising. I focused on shallower, wind-impacted areas and found only one additional location that was really loaded down with fish. Of course, in cold water, and with a lengthy morning feed that occurred through mid-morning, it was asking for a lot to find multiple aggressive schools of white literally just hours later. Nonetheless, in the vicinity of Area 149 in 26-27 feet of water, the classic “escalloped” bottom signature given off by bottom-hugging white bass was seen, and bait was in the area. With the wind coming in here strong, this was really looking good. As I let my slab down and got my depth adjusted, I immediately felt a thud. As I reeled in this hooked fish, the bottom sonar signal began to waver, indicating additional fish. I hustled my slab back down and caught another, then another. Soon, probably due to defecated or regurgitated chum now getting in the water on the tight confines of this spot, fish began to appear from bottom, upwards to 3-4 feet off bottom. I realized there were A LOT more fish here than I first suspected. I the span of 70 minutes, I boated exactly 45 fish including 44 whites and a nice largemouth bass. This bass was the first black bass that I’ve caught mixed in with whites since the flooding and cold temperatures in place for nearly a month now. By about 4:20 these fish began to settle down and then shut down completely. This was by far the most aggressive action I’ve encountered since even before the flooding — actually, since the temps. dropped out of the 50s. I hope we’re on the lead edge of a turnaround, but there is cold and rain forecast for the early part of the week ahead, so, time will only tell. Today was a good day — and I thank God for that. 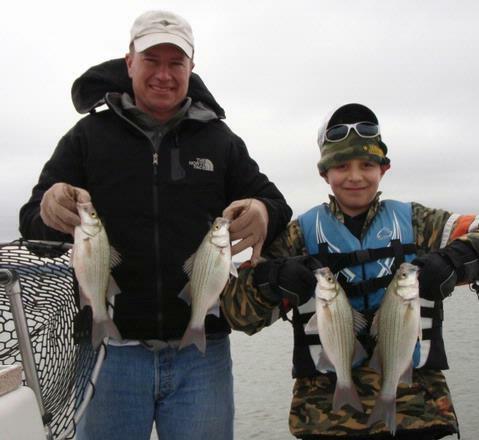 Fished a half day uncle/nephew trip with Justin W. of Colorado and his nephew, Jake W., of Salado. Justin is a commercial pilot and flies C-140’s in the Air Guard. Jake is a 4th Grader at Salado ISD who is, for a short time longer, without his dad, Jason, who is currently deployed to Iraq as a reservist in Army Aviation. Justin (L) and Jake (R) with four fistfuls of vertically jigged white bass taken out of 48 degree water on what was the best trip I’ve had to date since the flooding. After Wednesday’s failed experiment on Belton, I decided we’d put this trip together on Stillhouse, and that turned out to be a good decision. The water level on Stillhouse is now at about 3 feet above full pool and the water has cleared up pretty well. I did note that any significant wind now immediately stirs silt up on the impacted shoreline leading to localized stained water, but, the lake as a whole is in pretty good shape once again. We did some searching with sonar around (obscured) sunrise, and found some bait and some fish tight to bottom in 25-27 feet of water near Area 314. I chose TNT180’s in 3/8 oz. to start the fellows off with — a bit heavier than I really like for cold water, but, it allowed them to get the feel of the jigging rhythm and know where their baits were in relation to bottom at all times. Once we got situated and they got the hang of jigging, things began to happen for us. The first fish over the side was a small crappie. No sooner had we caught that fish, than 4 gulls came and began to patrol and act hesistant to leave an area within 200 yards of us. I felt as though fish were in there, but just not cranked up yet, so, despite the slow action, we hung with it. 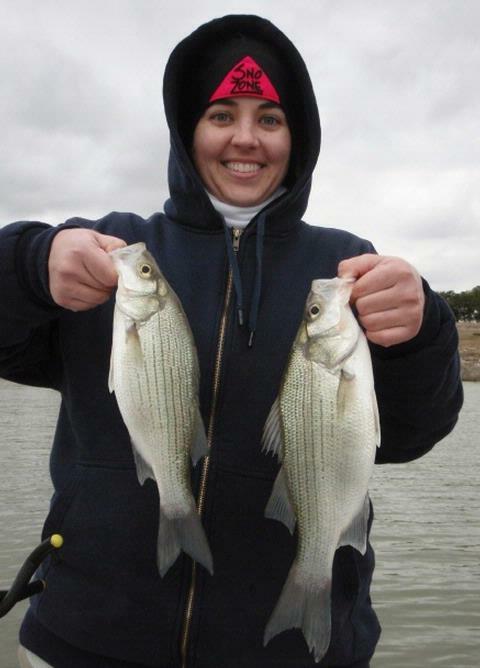 By around 8:30, we still had birds present, but had only put 2 more fish (both white bass) in the boat. It was getting steadily brighter, and the wind was very steady. I decided to move us in a bit closer to shore where the effects of this wind would be impacting on the bottom by moving silt and, as a result, the rest of the food chain. As I moved in on Area 595 (BA: 1O, 4HG, 6L, 3T) the sonar began to reveal fish laying belly to the bottom here from 25 feet right up to 16 feet. I oriented the nose of the boat into the wind, put a buoy out well upwind to orient onto, and we went to work on these fish for about 2 hours straight. The action never got frenzied (remember, the temperature is still in the 40’s), but it was steady, the bites were solid, and the fish cooperated for a much longer spell than they typically do in cold water. Eventually, around 10:40, things ground to a halt. We’d put 41 fish in the boat by this time. I was encouraged that we’d found fish in water as shallow as 16 feet, and so, in order to cover a lot of water quickly looking for a few remaining active fish, we set up with a slow, flatline troll in 4 different areas (Areas 116, 352, the 114-336-319-343 circuit, and Area 999), but that failed to produce even a single fish. By around noon, we knew we’d seen the best of it and decided to hit just one last area on our way back the the ramp. We stopped and looked over Area 145/148 with sonar and found suspended bait and a few gamefish mixed in at around 20 feet over a 35 foot bottom. I’d hoped to give Justin a shot at “sniping” a fish during this trip, as he’s done a bit of ice fishing, and this technique is much like that method of angling. We spotted a lone fish on sonar, and so I demonstrated the “sniping” technique to Justin and landed the fish I had targeted. Justin was now pumped to get one of his own! As we hovered in place, a single, suspended white bass appeared on sonar and, despite the wind, we were able to hang with it and keep it on sonar as Justin got his lure situated correctly. We watched together as the fish’s sonar signal merged with the lure’s sonar signal and Justin’s rod tip went down. He responded with a good hookset and we landed that one last fish via “sniping” — a pretty cool, high-tech end to a very good cold-weather season trip. We ended the day sharing an outdoor lunch at one of the park sites on the shores of Stillhouse and then parted ways. For our efforts today, we boated a total of 43 fish. This was the best trip I’ve had up to this point since January 27th, which was before the flooding rains of 29-30 January. I was really impressed with 9 year old Jake. 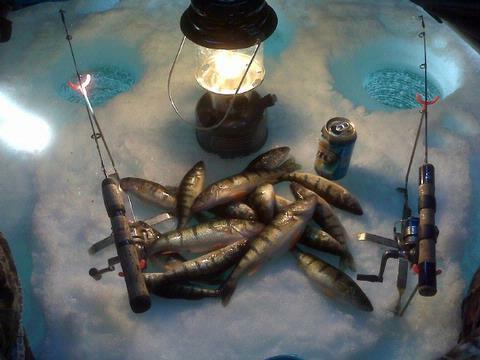 Winter fishing in such cold water doesn’t offer a great variety of tactics. He stayed with the vertical jigging regimen for the vast majority of the trip and did much better than most kids his age would have under such conditions despite cool, damp winds and red, cold hands. He was a trooper! Tough day today!! After a glimmer of hope provided by a catch of 30 whites this past Saturday on Stillhouse, I thought I’d give Belton a try to see if things were improving there, too. Granted, today’s weather was less than ideal, but, I spent 4 plus hours, accompanied by a fishing buddy (who, based on these terrible results shall remain nameless so as not to tarnish his credentials!!) out there with only 2 fish to show for all that effort. Bottom line — Belton is just tough right now — the water is high and not coming down all that quickly, yet the gates are open wide and there is a lot of water movement through the reservoir. This trip was taken in advance of two paid trips forthcoming this Friday and Saturday in an attempt to nail down which lake was going to provide me with the best shot at putting my clients on fish. Well, that objective was accomplished!! Upon launching today I was encouraged to once again see a multitude of birds working, but, as we watched these birds closely, it was clear that they were feeding on small schools of threadfin that were feeding on the surface in the low-light period before and after sunrise. These birds were lightly sipping, not aggressively diving, thus indicating the bait they were feeding on was not pushed to the surface by gamefish. We fished and ran sonar over a number of areas and wound up catching both fish we landed (a smallish white bass and a short hybrid) both in the vicinity of Area 500 after I spotted two loons working in that area. Both fish responded to a sniping approach. I should note that we both had significant numbers of fish refuse that very same technique both before and after these fish were caught. I fished an 8 hour trip today and was glad to see things starting to turn around. We have a dry forecast which means no more dirty water flowing in. This week ahead we should see the water warming a bit, clearing, and dropping (which means it will be flowing). With some more favorable winds like we had today, the fishing should pick up. Every single fish I caught today was suspended in the upper 2/3 of the water column from 33 feet up to 8 feet deep. I made use of the “sniping” technique all day using ice jigs. 2 of the 30 fish caught today. That’s the Dana Peak playground equipment standing in flood water in the background. Air Temp: 38F at trip’s start, warming to a high of 53 by mid-afternoon. Wind: Winds were due S. at 7 at trip’s start, building to 15+ in the afternoon. Skies: A freezing fog was beginning to lift as I launched with skies clearing to fair by midday. Environmental Note: Stillhouse is 7′ high and is now dropping very slowly; the water is stained but clearing. The key to success today was finding bait concentrations with sonar and then fishing in and around the bait for the gamefish that were lurking nearby. Birds, which are usually of great help this time of year, are few and far between and were simply patrolling and finding little. I found one dense concentration of fish spread from Area 429 to Area 594, and 3 concentrations that were more scattered. These occurred at Areas 337, 254, and 102. Once the fish were found, they weren’t all that difficult to catch as the weather conditions were very favorable today. I could provoke a response from 1 in every 3-4 fish I got on sonar, and of those that responded, 3 out of every 4 would strike. I wound up catching 28 white bass of which 24 were keepers; I also caught 2 legal crappie. I fished a difficult 3 3/4 hour exploratory trip today to see if I could put something together for a booking this coming Thursday. 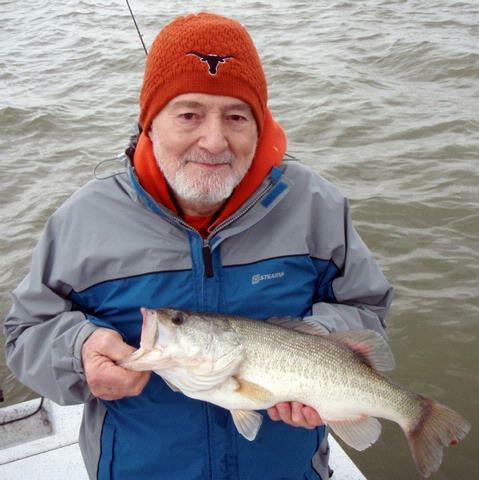 I fished Belton because, due to its size, there remains some relatively clear water in areas where fish should be this time of year. Unfortunately, most of the seasonal fish-holding water on Stillhouse is now very dirty, to the point of appearing opaque. 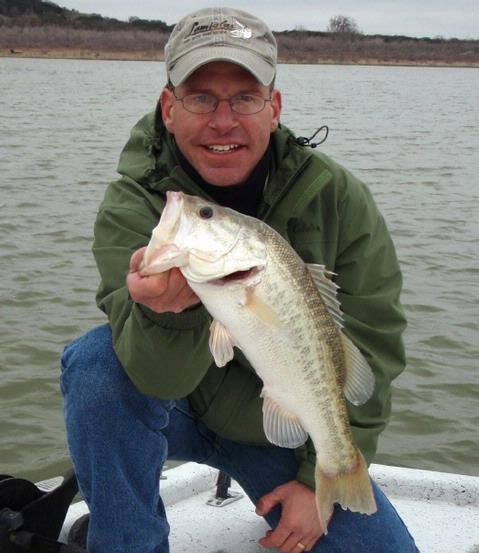 Fish were hard to come by today on newly flooded Belton Lake. That is a half-submerged outhouse and swim area sign in the background. As the water crested today, it stopped just short of the asphalt at the top of the concrete boat ramp. That’s the now useless courtesy dock floating in the background. Air Temp: 45F at trip’s start. Wind: Winds were light and variable until 10, then blew SW at ~9 thereafter. Skies: Skies were bright and clear until the wind shift, then went fair and transitioned to 30% cloudy. There was no helpful bird activity today. Sonar revealed areas with significant bait holding very high up in the water column in two distinct bands — one at 25-31 feet and another at 40-44 feet. The only fish I found today were very scattered and very hesistant white bass appearing individually on sonar. In three areas, Area 156, Area 502, and just west of Area 154 there were enough individual fish in close enough proximity to cause me to stop and attempt a sniping approach with an ice jig. Nearly 4 hours of effort yielded 3 fish including 2 keeper white bass and a short white bass, with two other strikes missed, both of which I am certain were white bass or juvenile hybrid, as well. The water is cold, off colored at best (and muddy in many places on Belton, too) and has risen ~10 feet in a very short time span. It’s just going to take some time and some dry weather to settle back into a status quo before we can enjoy success with any regularity again.